1)Go to Start and click on Control Panel. 2)Control Panel window will appear. Double click on Network Connections. 3) Network Connections window will appear. Right click correct Local Area Connection by identifying correct card and click Properties. 5) From the device status, it shows the driver status. If there is problem on driver, you can click Troubleshoot…to troubleshoot the problem with detailed instructions provided by Windows XP. 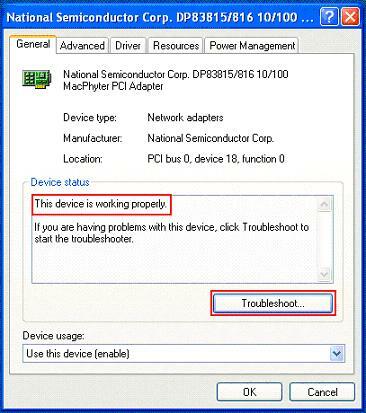 Note: The Troubleshoot… feature which provided by Windows XP is pretty lengthy, but it’s a good resource to learn more about this device driver. Note: Reseat the card and reinstall the driver if don't able to solve driver problem after troubleshooting. Make sure there is light on the card after connecting with Ethernet network cable. You can also read how to check MAC address of your network card here.